Lisa and I recently returned from 3 weeks in the Dominican Republic. I'm just putting up some of the photos for now. I'll come back a bit later, and tell a more complete story so that the photos have some context. About a week or so into the trip Lisa emailed her Mom and Sis. Her description of what we were up to follows. "In the morning we drink coffee and look at the ocean, during the day we sit in the sun and look at the ocean, in the evening we drink wine and look at the ocean." I thought Lisa's summary of the trip up to that point was exactly what we did for the entire three weeks. We've had bigger adventures before, but never a trip so completely relaxing. For 20 days in a row we swam in the ocean and sat in the sand and sun. We traveled a couple hundred kilometers of the North Coast via a mode of transportation that the locals call Gua-gua's. We stayed between Puerto Plata, and Las Galeras with stops at Sosua, Cabarete, Las Galeras, El Cabito, Playa Madama, Playa Fronton, Samana, Rio San Juan, and Playa Grande. Whenever we weren't at the beach we were busy making our way to another beach. I thought the highlight was a few days of surfing at Playa Encuentro. Lisa and I caught the same wave on Valentines day. Also very exciting were a couple of jungle hikes to deserted beaches with nothing but a photo of a hand drawn map for guidance. It was worth the 8km slog through the steamy jungle, and the scenery was right out of a pirate movie! Strange Creature, Anyone know what this is? Update: After 9 months I finally built a frame for a beautiful painting we got in a market for $60. It's an original done by a local artist and we couldn't be happier with the way it brings memories of the Republica Dominicana. 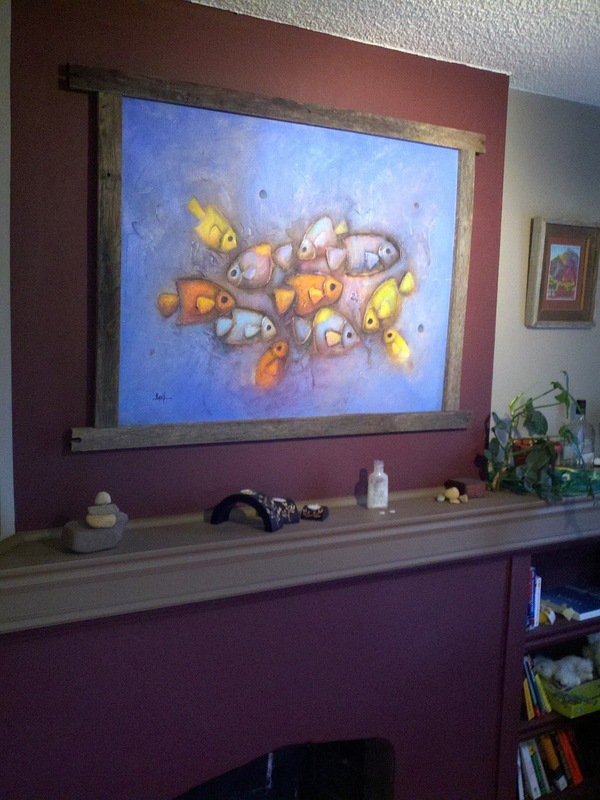 We purchased this painting about 4 days before returning home. The night before our flight we went for a swim in a small bay near Sousa. Our objective was a reef we heard about, which was quite a ways out and would've been near impossible without fins. We swam and swam and discussed turning around, but stuck with it for just a bit further. We were super glad we stuck with it because the scene dramatically went from the featureless sea floor to a beautiful reef with colorful fish everywhere. I looked at Lisa and there were thousands of fish surrounding her. Lisa said the same about me when we returned to shore. 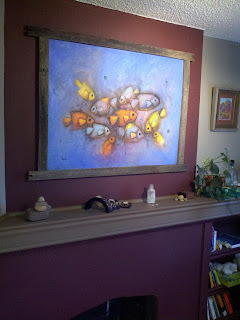 The fish we swam with on that last afternoon in the DR looked just like the fish in this painting. NOT a tree house ????? Just a cabin. Have stayed there, and in a real tree house in Costa Rica. Thanks for your feedback. "treehouse" is the El Cabito name for it, not mine.